Matthew’s most recent clients include Adidas, Facebook, BBC, Microsoft, Sony, Warner Brothers, Apple, Disney, Google, Clorox and many more. Matthew’s story credits include Toy Story, Toy Story 2, Toy Story 3, Monsters Inc., Monsters University, Finding Nemo, UP, Cars, Ratatouille and other films currently in development. 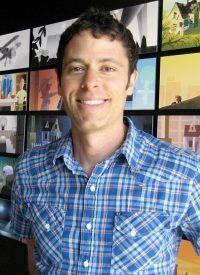 With over 20 years experience creating and developing dozens of films, TV shows, and video games, at Pixar, The Simpsons, ILM, and other studios, Matthew Luhn knows what it takes to create memorable stories with enduring characters. From filmmaking to business, Matthew’s story talks are beneficial to anybody wanting to improve their story skills, or learn the persuasion of great storytelling. In Matthew’s story seminar, he will share his process for creating new ideas and characters, how to develop great stories and story structure, and how to realize your story ideas from script to storyboards to finished product. Dominic is an expert in creation, unique storytelling, technology and the arts. He is a highly skilled public speaker and has previously spoken at TEDx talk seminars on the subject of creativity and design.